A friend of mine bought LNOE and allows it to live at our place (score, right?!) and I’m so happy that he did since it probably wouldn’t be a game that I normally would have picked up. What I love from the start of this game is that you can pick a scenario from the scenario cards to start. Its basically like picking a movie plot for your game. And that’s really what playing this game feels like – like you are in the middle of a zombie apocalypse movie and you’re rushing the clock to escape or accomplish a number of other scenarios. There are many epic moments to be had like running to the truck with keys and gasoline in hand and escaping with the other humans who are still alive or protecting the manor home from being overrun by zombies. It never fails after completing the game we talk about it afterwards as if it really happened. As fun as this game is there are a few cons to it. The first is that playing with four heroes and 2 zombies can be incredibly boring – especially if you are a hero. The actions are short and your turn can literally last for 3.5 seconds. The zombies have such an upper hand as well. It’s very difficult to win if you are a human however this could be a pro for some because let’s face it – a hoard of zombies should have the upper hand am I right?! Another draw back for our gaming group was the directions. I don’t know if things were lost in translation but there are many questions that arise that I simply cannot find the answer to in the instruction book. I find the most enjoyable way to play LNOE is a two player game. This by far is the best scenario as the zombie player and hero player have a balanced turn. Oh and that soundtrack that comes with the game? Most epic fail ever. One of the worse soundtracks BUT we made our own soundtrack from movies like Friday the 13th and other classic horror films as well as music from The Walking Dead and it adds to the ambiance big time! I was completely on the fence about buying this game. I am a sucker for great art so that immediately peaked my curiosity. After watching a few instructional videos and a review I decided to go ahead and buy it knowing that the possibility was there that I would hate it. Components – As I said before the game is beautiful. The only issue I had was the point markers are so incredibly tiny and very easy to lose. I am perplexed as to why they made them so small! The cards are also small – same as Ticket To Ride. Gameplay – The game objective is simple – have the best experience on your trip from Kyoto to Edo. Sounds boring right? And yet so intriguing at the same time?! Your journey consists of meeting villagers, taking relaxing baths with monkeys (yep – monkeys!) and collecting hoards of souvenirs and eating some great Japanese cuisine. Completing different tasks like this gives you a different number of points. At the end additional points are added for people who completed different objectives throughout the game such as the person who spent the most on food or the person who collected the most souvenirs. So what did I think after I played? Well I only played a two player game which has slightly different game rules but I must say I did enjoy it. 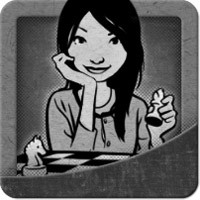 I felt like it was a relaxing game and yet there was still enough strategy to keep you engaged. Do I block another player so they can’t go to the farm and make some extra cash? Or do I move faster to get to the inn first and get my choice of the best cuisine? I am saving my score until after I play this weekend with four players. Until then, happy traveling! Update – The gameplay is more strategic with more players and therefor more enjoyable. After playing this weekend with four we all had a really great time with it and it will be in our regular rotation on gaming weekends! So happy I picked this up! As a designer myself I can appreciate great design and this site has it. There is so much out there in terms of board game review sites but nothing come close to this. I never join anything – I’m not even on Facebook – but I stumbled upon your site today and I’m happy to be apart of it! What a great way to keep track of the games you want to purchase as well. I’m actually about ready to go out to my LFGS (Local Friendly Game Store) to purchase some games I’ve seen on this site. Keep doing what you do! Reading the instruction booklet can be quite frustrating since the terminology used in the instructions are completely foreign to the reader. I highly recommend reading the booklet backwards. Read the “anatomy” pages first then read “tile taxonomy” then finally start from the beginning and read how to play. Yep you heard right – play with accents! I realize this makes absolutely no sense but man does it make for a hilarious night! Who doesn’t love trading in chaos AND sounding like they are from a distant land?! Get really into the theme of the game and play with chopsticks to grab your wasabi pieces and if you are really talented your ingredient tiles too. We discovered that involving multiple players in a single trade is a lot more fun (don’t ask how we discovered this because I don’t want to tell you that we read the directions wrong and this is the way we have always played. That would be embarrassing). As long as every trade goes through the active player, cards do not have to be planted until the trade is complete. Meaning active player A can take cards from player B and give them to player C to get cards from player C to give himself and to player B. But alas our gaming group is happy again since we made our own soundtrack compiled from classic horror movies like Friday the 13th and Halloween with some Walking Dead as well. What an awesome gaming experience! The music always seems like it works seamlessly with whatever is going on in the game! I often times play this as a solo game and I actually find it more enjoyable for a few reasons. We normally have one or two people in our game group that ends up dominating everyone else’s decisions. So for me I find it to be a stressful gaming experience with certain groups of people. Playing solo doesn’t differ from the original game at all. Set-up is the same – just use two pawns that you go back and forth between and still keep their cards separate following all normal rules. Hoping to play a little Last Will and Mice and Mystics on Saturday. And we just decided to turn the basement into a board game room so I have a little searching to do for shelves and a new table! Played games with my husband last night. I wouldn’t let him leave the table until I beat him at something… Played Last Will, Tokaido and then I finally beat him after two laps in Formula D!!! Game night is tomorrow night at a friend’s house. We are going to try Munchkin Zombies for the first time and then King of Tokyo, Catan and possibly a little Wasabi! Have a completely new group coming over to game this weekend. None of them are into board games so it should be interesting. We are likely going to try Pit, King of Tokyo and Bohnanza. For sure Mice & Mystics tomorrow. Have played three times and still haven’t passed the first chapter (my husband and I are convinced we’re missing something…). Has anyone found the expansion pack in English yet? Or know if this is something Ystari is planning? @Stonemason Mice and Mystics has a second book that will be available soon and is in its editing phase now and a third that is currently in play testing. So the game has life after the first book is finished if you didn’t want to go back and replay. @P-Cokes We had the same question when we first started. We decided that every time we encountered a new tile we would read aloud any special instructions on that tile as well as read the special search items. There really isn’t any other way to do it from what we have discovered. I found this game review if anyone is interested. After watching it sounds like my type of game and I may just have to pick this one up! Thanks so much for the video link! Helped out a lot! I’m really on the fence about getting this. Its a beautiful looking game so I may want to grab it based on that 🙂 Would anyone be interested in talking a little bit more about the game mechanics? Hello! Happy to be here at one of the happiest websites around where I can get my daily fix of all things board games! Since I am an illustrator and designer I enjoy games with great art and will buy a game based on the art alone :) I also gravitate to and enjoy games that have a good story or theme to them and the more unique theme the better.